The Government of Denmark has thrown its weight behind the initiatives of Governor Godwin Obaseki-led administration in Edo State, conceived to stop the illegal migration of Edo people abroad. Torben A. Gettermann, Danish Ambassador to Nigeria, flanked by Danish Ministers addressing Governor Godwin Obaseki during a visit to the governor at the government house in Benin City on Thursday, August 17, 2017. 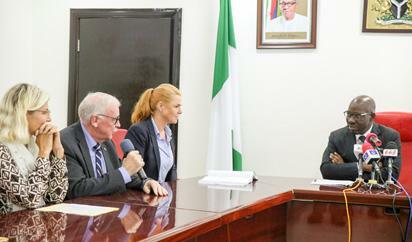 The Minister for Development Cooperation, Denmark, Ulla Tornaes, who was part of a delegation to Government House in Benin City on Thursday, led by the Ambassador of the country to Nigeria, Torben Gettermann, pledged her country’s readiness to collaborate with the state government in tackling illegal migration in the state. The visit is coming two days after Governor Obaseki set up a task force against human trafficking, which is fuelling illegal migration and few days after the governor visited the Edo State-Saro Maize Farms, an agricultural initiative of the state government for unemployed Edo youths. According to the Danish minister, full knowledge of the root causes of illegal migration of Edo people to Europe would enable her country to collaborate better with the Edo State Government in addressing the negative trend. “We want more knowledge of the root causes why people leave Africa to Europe because we know you need these people to contribute meaningfully back home. l personally believe that one of the main reasons young people leave Africa to Europe is the lack of hope for the future which is caused by lack of jobs,” she said and added that the government of Denmark was working on policies that would create jobs in Nigeria. The Ambassador of Denmark to Nigeria, Torben Gettermann, said the visit was to strengthen collaboration with the Edo government in different areas especially in the area of illegal migration which has become a challenge to the state government. In his response, Governor Obaseki commended the delegation for the visit and steps being taken by the Government of Denmark to curb illegal migration from Nigeria to Europe. He said his administration has identified illegal migration as a challenge and would leave no stone unturned in curbing the negative trend which has for so long tarnished the image of the state. He told his visitors that a home-grown task force against human trafficking was set up recently in the state to complement the efforts of the federal government in addressing illegal migration. Obaseki assured that his administration was committed to tackling the root causes of illegal migration through the strengthening of basic and technical education, resettling of returnees and revamping of the state economy. “We as a government have a role to play, and we are determined to put the right policies and structures in place to ensure that our youths feel comfortable back home rather than take dangerous routes to Europe” the governor said. The post Denmark backs Obaseki’s initiatives on tackling illegal migration appeared first on Vanguard News.